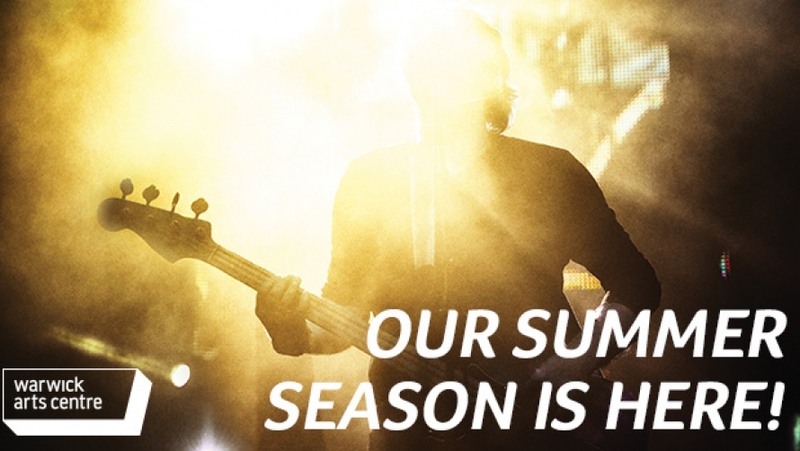 Our Summer Season is here! Leading on the theatre stage, Bells and Spells (Tue 21 & Wed 22 May) is a stylish piece of international work from Charlie Chaplin’s daughter Victoria Thierrée Chaplin. Having premiered in Paris to outstanding reviews, it stars actress and circus artist Aurélia Thierrée, in one of only two UK dates. Paul O’Donnell’s Bon Jovi musical, We’ve Got Each Other (Fri 10 May), returns home to Coventry for one night only. Then, turning adversity into art, Renu Ghalam and Aman Tamang use acrobatics to tell their timely story of being trafficked in the Nepalese circus in As a Tiger in the Jungle (Wed 29 May). Lycra-loving baritone and drag sensation Le Gateau Chocolat has taken the world by storm recently, following a star turn as Feste in The Globe Theatre’s Twelfth Night. He will be at Warwick Arts Centre this summer with his latest work, Icons (Fri 26 Apr), as well as Duckie (Sat 27 Apr), his first show for children, based on Hans Christian Anderson’s The Ugly Duckling. Family theatre continues with ZOG (Fri 24 – Sun 26 May), an adaptation of Julia Donaldson and Axel Scheffler’s beloved children’s book and Luca Silvestrini’s Protein returns with The Little Prince (Sat 1 Jun), a dance twist on Saint-Exupéry’s novel that was in development at Warwick Arts Centre in 2017. Bestselling author and Children’s Laureate Michael Morpurgo (Wed 15 May) – whose novel War Horse was adapted into an Olivier award-winning play and Oscar nominated film – is set to inspire the next generation of writers in an evening of storytelling, whilst ‘Queen of Shops’, Mary Portas (Fri 17 May), will be discussing her career and her new book, Work Like a Woman. Leading the comedy line-up is The Guilty Feminist Live (Fri 24 May) with Deborah Frances-White, which has become a global phenomenon with over 50 million downloads. Sofie Hagen (Fri 10 May) will also be back in Coventry, following her sell-out performance in 2017, with the show that won her the Edinburgh Fringe Best Newcomer award, plus a chance to hear from her new book, Happy Fat. Having won Best Live Music Venue in the 2019 What’s On Warwickshire Awards, Warwick Arts Centre will be welcoming three time Grammy award-winning pianist and Snarky Puppy member, Bill Laurance (Sat 27 Apr), as well as Mercury Prize nominated folk artist, Sam Lee (Wed 24 Apr), who will bring his celebrated Singing with Nightingales starlit walk inside. Warwick Arts Centre’s Concert Series season comes to an epic close with the Russian Philharmonic of Novosibirsk (Tue 14 May) and their fitting programme of Rachmaninov, Rimsky-Korsakov and Tchaikovsky, featuring Alexander Sitkovetsky as violin soloist.